The Sliabh Aughty Furnace Project aims at preserving, researching and spreading the information on the history of the iron industry in northeast Co. Clare and southeast Co. Galway. For centuries, the western shores of Lough Derg were tranquil and heavily forested. People lived in small settlements in the cleared areas and local lords would compete with each other over the better lands. This would all change in the 17th century. As the area had high quality iron ore and vast amounts of wood, mostly oak, it quickly attracted the newly arrived Protestant planters. They introduced a technology never seen before in Ireland: the blast furnace. Locally, the earliest of these furnaces, which are usually square blocks about 7m long and wide and up to 10m high, was probably built at Ballyvannan in Co. Clare. It might have been built as early as 1611 and a large part of the furnace is still standing in the woods behind Ballyvannan House. The next blast furnace was constructed at Scarriff in Co. Clare in the 1630s. This is actually not correct: the furnace was built first and Scarriff was then built around it. 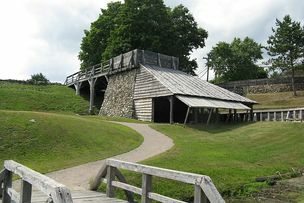 This furnace is of special interest as the people who were responsible for building this furnace later moved to Saugus in the 1650s near Boston, Massachusetts, where started up the first active blast furnace in North America. It took several decades after the Civil War of the mid-17th century for the iron industry in the area to recover. In the 1680s the Scarriff furnace was started up again and a new complex built at Woodford in Co. Galway. 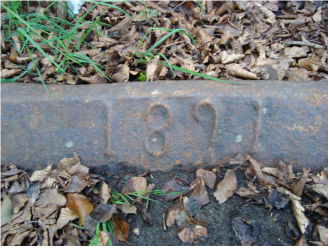 In Declan Walsh' Pub in Woodford you can still see a cast iron bar, with a date of 1681 on it, which was part of the local furnace. We are well informed about these two furnaces during the 1690s as an important business archive, the Emmerton Papers, still survives in Nottingham. These papers have never been studied before and offer a unique insight into life and industry in western Ireland in this tumultuous period. In the early 18th century, several new ironworks were built: at Bealkelly, Feakle, Coolcoosaun and Whitegate in Co. Clare and Derryoober in Co. Galway. We have very little documentary evidence for these late furnaces, but three of them are still preserved. 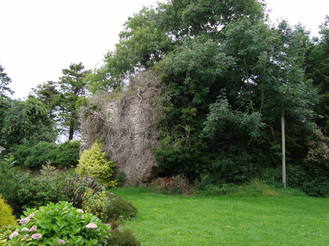 The furnace at Bealkelly near Tuamgraney is an imposing monument with buttressed sides and located next to a small ravine. Its inner casing has been removed and around the top of the furnace the slots for the beams which would have supported a wooden superstructure are still visible. At Whitegate, in a townland called Furnace, are the substantial remains of a huge blast furnace, towering over the nearby bungalow. It has many unusual, and still unexplained, features: a tunnel built into the back of it and a peculiarly angled side wall, possibly for supporting the loading ramp. 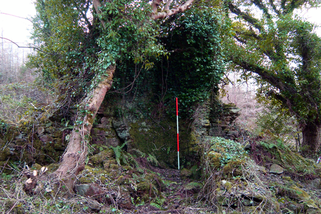 The last furnace, at Derryoober, is the smallest and best preserved of the lot. This cute little thing is set in the middle of a green field with no apparent water supply. Paul and Gerard are still arguing if this furnace was ever worked or if its construction was even finished. All these furnaces are on private property and permission should be sought before visiting them. All the monuments described are unstable structures and all care should be taken against injury and damage to the furnaces. ©2019 Sliabh Aughty Furnace Project. All right reserved.